The Merchantville Fire Department - Niagara Fire Company provides fire suppression, prevention and education for the residents of Borough of Merchantville. 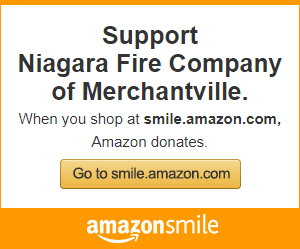 The purpose of this page is to inform the community of the happenings of the Merchantville Fire Department - Niagara Fire Company. The second goal of this website is to act as a gateway to answer any questions the residents of the Borough may have. Engine 1291 along with Delran ladder 2315 cover Cinnaminson while they operate at a working dwelling fire. Ladder 12-9 covering Oaklyn Fire Department withLawnside Fire Company this morning while they operated on a dwelling fire. Another successful Operation Santa! Merry Christmas from the officers and members of the Merchantville Fire Department! We would also like to thank Johns landscaping for the use of their trailer to help bring Santa to Merchantville. Photos of the apparatus from before the Borough of Merchantville annual Holiday Parade. Thank you to Pennsauken Fire Department and Barrington Fire Company for sending apparatus to celebrate the holiday season with us. April 13, 2018 Ladder 12-9 was dispatched to the 3100 Block of Cove Rd in Pennsauken for a dwelling fire. Crew from L12-9 conducted primary search of the second floor with searches proving negative. The fire was quickly brought under control with no injuries. Ladder 12-9 covering Oaklyn Fire Department with Lawnside Fire Companythis morning while they operated on a dwelling fire. Last evening Ladder 12-9 was special called to assist the Pennsauken Fire Department with the evacuation of residents during a kitchen fire. 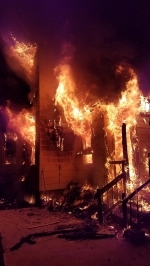 At just before 3 AM Ladder 129 was dispatched to Pennsauken for an All hands fire on the 7400 block of Zimmerman Ave while Engine 1292 had covered at Sta. 11-2 with Palmyra Fire Department., Cinnaminson Fire Department and Westmont Fire Company No. 1. Listen live to Camden County Fire and EMS by clicking below. This site has been viewed 55,593 times.